Tuplets are useful if you wish to input an irrational or irregular rhythm to your piece. This becomes convenient to avoid constant time signature changes. This becomes necessary if two or more staves contain different irregular patterns. An example of this would be Chopin’s Fantasie Impromptu Op. 66, where the right hand plays regular 16th notes, and the left hand plays irregular eighth notes in the ratio of 3:2 in 4/4 time. Tuplet entry in Music Jotter is amazingly simple. Whereas other music notation programs require continuous reapplication of a tuple mask, Music Jotter avoids this altogether. 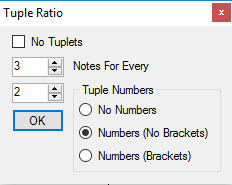 Once your tuple ratio is set, you simply compose your notes and Music Jotter automatically groups notes without the need for tuple reapplication. This saves an incredible amount of time if your piece uses tuples consistently throughout. The notes tab controls tuple options accidentals, and grace notes. The numerator will correspond to the number of notes that you would like to fit in the measure. The denominator represents the number of notes that normally fit into a measure of a time signature that you would like to replace. No Numbers: If it becomes too tiresome to view a commonly used tuplet on a score, you may wish to remove the tuplet number altogether. Numbers (No Brackets): Display a number without a bracket to represent the tuplet. Numbers (Brackets): Display a number with a bracket to represent the tuplet. To turn off tuplet note entry you must do so by checking the checkbox that is labeled No Tuplets. In 4/4 time, 3 notes will take the place of 2 notes. If 2 regular half notes fit into a measure, 3 irregular half notes now fit into the measure, due to this rule. In 4/4 time, 5 notes will take the place of 4 notes. If 4 regular quarter notes fit into a measure, 5 irregular quarter notes now fit into the measure, due to this rule. In 4/4 time, 7 notes will take the place of 4 notes. If 4 regular quarter notes fit into a measure, 7 irregular quarter notes now fit into the measure, due to this rule. In 4/4 time, 9 notes will take the place of 4 notes. If 4 regular quarter notes fit into a measure, 9 irregular quarter notes now fit into the measure, due to this rule. In 4/4 time, 13 notes will take the place of 8 notes. If 8 regular eighth notes fit into a measure, 13 irregular eighth notes now fit into the measure, due to this rule. In 4/4 time, 27 notes will take the place of 16 notes. If 16 regular 16th notes fit into a measure, 27 irregular 16th notes now fit into the measure, due to this rule.